The Alenia Aermacchi M-311 is a turbofan-powered military trainer aircraft. It is a development of the Aermacchi S-211. The M-311 is a small tandem two-seat shoulder-wing monoplane with a retractable tricycle landing gear, powered by a single Pratt & Whitney Canada JT15D-5C turbofan. It is based on the earlier S-211, with the addition of both structural and equipment improvements. The airframe has been strengthened, and a glass cockpit and modern avionics have been added. As a basic trainer, the aircraft is designed to complement the Aermacchi M-346 advanced trainer. The aircraft was designed with a secondary close air support capability with five underwing hardpoints. The prototype aircraft first flew in June 2005. In April 2008, Alenia and ENAER of Chile signed an agreement to jointly manufacture and sell the M-346 and M-311 in South America. On 28 May 2008, Boeing and Alenia signed a joint agreement to cooperate on marketing, sales, training and product support for both the M-346 and M-311. 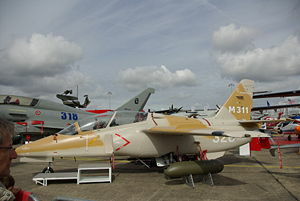 M-311 Modernized and uprated version announced by Aermacchi in 2004 (two protoypes built). Up to 1000 kg (2,205 lb) of weapons on five hardpoints, including gunpods, bombs, and rockets. Alenia Aermacchi M-311 Pictures and Alenia Aermacchi M-311 for Sale.